Virarajendra Chola was one of the greatest rulers of Chola dynasty who went on to conquer neighboring lands. He was born in a dynasty which once saw great rulers like , Karikala Chola, Vijayalaya Chola, Aditya Chola I, Parantaka I, Rajaraja Chola I, Rajendra Chola I, Rajadhiraja Chola I, Rajendra Chola II etc. He was the younger son of the great Rajendra Chola I and brother of Rajadhiraja Chola I, Rajendra Chola II. He is well known for "Battle Of Vijayawada" about which we will be discussing shortly. Virarajendra Chola succeeded his brother Rajendra Chola II around 1063 A.D. His reign was between 1063-1070 A.D. He was a brave, able, wise and strong king who not only maintained the status of the Cholas but also was able to increase the Chola strength. He patronized arts and cared for temples of all deities specially lord Vishnu. The name of his queen is Arulmolinangai. Earlier in his life, Virarajendra Chola helped his father Rajendra Chola in administration and also later helped his brothers Rajadhiraja Chola and Rajendra Chola II in administration during their respective reigns. He was appointed in Eelam(Srilanka) by his father and was appointed as viceroy of Srilanka by his brother Rajadhiraja Chola. During the reign of his elder brother Rajendra Chola II, he served as the lord of Uraiyur. We can see that, in a span of around 18-20 years, there was a rapid succession in the Chola kings as three brothers ruled one after another. This gave an opportunity to the enemies of Cholas as they thought that it was a perfect time for them to invade the mighty Chola empire. Their enemies include Western Chalukyas, Singhalese (Ceylon), Pandyas and even the Cheras. During the beginning of his reign, Virarajendra led a expedition and killed the king of Pottapi in the Kerala country. Somesvara I tried to invade Chola empire. A battle took place at Kudala sangamam, on the banks of Kumudvati and Tungabhadra rivers between Western Chalukyas and Cholas. In this battle Somesvara I was very easily defeated by Virarajendra Chola and he escaped from battlefield. Another battle took place between Virarajendra and Chalukyas on the banks of unknown river around 1066 A.D. 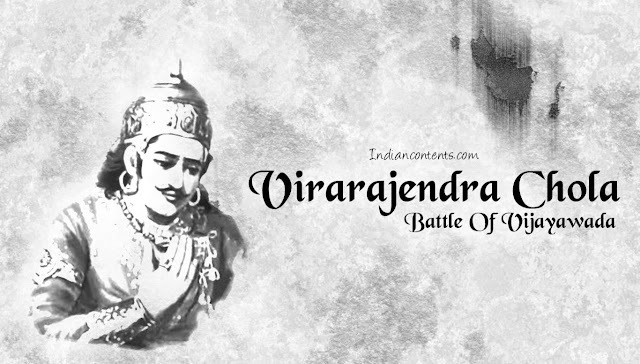 In this battle Virarajendra brutally killed number of Chalukyan generals. Soon after the second defeat in the hands of Virarajendra Chola, Somesvara I sent a message to Virarajendra to meet him at a place called Kudal on a specific date. Virarajendra waited eagerly to face Somesvara I and teach him a lesson once again but Somesvara I did not turn up. After awaiting Somesvara's appearance in vain for a month, Virarajendra overran the Chalukyan kingdom and planted a pillar of victory on the Tungabhadra. Virarajendra then proceeded with his forces to Vengi with a determination to reconquer that country. A terrific battle followed on the banks of river Krishna between Cholas and Chalukyas. 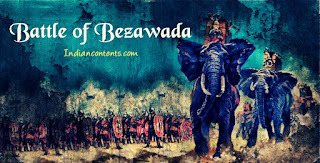 It was fought at Vijayawada around 1067 A.D. Virarajendra once again defeated Chalukyas in the battle of Vijayawada and reconquered Vengi which was lost to Western Chalukyas. The generals and army of Chalukyas fled in to the jungles of north. After the death of Somesvara I, his son Somesvara II ascended the throne around 1068 A.D. A dispute broke out between Somesvara II and his younger brother Vikramaditya VI regarding succession of their father. Vikramaditya VI requested Virarajendra for his help to be nominated heir to the Chalukyan throne instead of Somesvara II. Virarajendra defeated Somesvara II and made Vikramaditya VI as the Chalukyan king. Virarajendra also gave his daughter in marriage to Vikramaditya VI. Vijayabahu was the Sinhala king at that time who was ruling a small portion of Southern Srilanka. Most of the Srilankan Island was under the rule of Cholas. Vijayabahu started to revolt against the supremacy of Cholas on the Island. Virarajendra's army which was stationed on Island controlled the revolts and suppressed them. Vijayabahu then requested Burma king for help. The Burma king sent ships and soldiers to assist Vijayabahu. Virarajendra then sent a extra battalion of army to face the combined forces and was successful in defeated them. A king form Kadaram (Malaysia) requested Virarajendra for his help in claiming his throne. Virarajendra then conquered Kadaram on behalf of that king. The Cholas continued a series of raids and conquests throughout what is now Indonesia and Malaysia for the next 20 years. Virarajendra Chola died in 1070 A.D. after a very short but extremely victorious rule. He was succeeded by his son and heir apparent Athirajendra Chola. His achievements can be compared with those of Rajendra Chola I. He not only maintained such a vast empire but also made conquests and expanded it.